Windows Mobile devices have never been known for even decent audio output. Their business mindset has so far served as a good excuse for the poor audio. However, the HD is keen as never before on multimedia, so it better has audio quality up to the high bar it has set for itself. 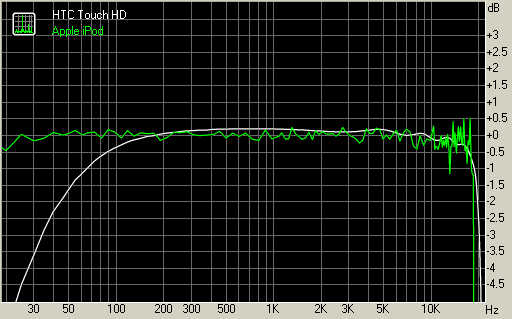 Audio is quite up to standard in fact, having great noise level, dynamic range and stereo crosstalk readings. The IMD and THD levels are also decent, albeit not spectacular. It seems as though HTC have put some sort of filter in the Touch HD, resulting in the frequency response graph you can see posted below. Still the Touch HD is yet another (following Diamond and the Pro) step up in audio quality for Windows mobile devices. The Touch HD built-in FM radio requires a headset plugged-in to work. Thanks to the built-in 3.5mm audio jack you are no longer limited to the originally provided headset. You can plug your favorite set of headphones as easy as 1-2-3. The Touch HD FM radio has an excellent interface much like the rest of the multimedia players on board and offers memory for some 20 radio stations. And with RDS also available we can hardly want more (except perhaps Traffic announcements, but come on we're talking a mobile phone here). The HTC Touch HD has a nice video player but it only supports the video/audio codecs available to Winodws. To enjoy a more versatile video support on the Touch HD (DiVX or XViD for example), another video player would be required, which has support for more file types than the stock variety. There are plenty of dedicated video players on the market to expand the video-playing options on the Touch HD. We resorted to the well-known Core player. The HTC Touch HD is pretty good at WVGA-res XviD video playback - we played an XviD encoded DVD Rip for PC playback and, luckily, there were hardly skipped frames. In all fairness the performance in some cases is a tad worse than it was on the HTC Touch Diamond (around 20%) but that could be expected with quite a lot more pixels that need to be refreshed (around 20%). The end result of watching videos on such a big display is however is totally worth it. Videos up to VGA resolution and bitrates up to 1.2 Mbps are OK with the Touch HD but going beyond those number is sure to result in skipped frames. If you ask us, this range is good enough for a handheld video player. So in conclusion, the HD huge WVGA display did count bigtime here: the video looked excellent, miles ahead of other devices. We cant imagine the guys who love to watch videos on their handsets making a better choice than the HTC Touch HD.